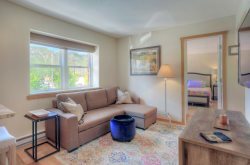 This condominium is one of the few true ski-in, ski-out accommodations at Durango's Purgatory Resort. This 2 BR, 3 BA includes private one king BR, and 2nd BR w a queen plus a twin over full bunk. Stairs to ski run. Fireplace in living room. Community Hot Tub Deck. Gazebo Pavilion. Upper-level condominium adjacent to parking area. Access to exterior hallways, ski lockers adjacent to the individual condo. Security code accessible community hot tub deck, plus gazebo with outdoor tables, gas grill, fire pit. Immediate access to ski run behind the complex via a catwalk and stairs directly behind building. Washer and dryer are in the condo. Ski lockers are on rear deck just outside the rear door of the condo. Best place in this area for sure! Everything was set up great, clean, and ready to go. We walked in and stayed our time with no hassles. We loved everything about the location and will probably be back for ski season.